The 1950's was a blossoming time for rock n' roll, the love child of rhythm 'n blues and jazz as names like Bobby Vinton, Buddy Holly, Dion, and Paul Anka were added to Billboard charts. Many would agree, however, that it was one dynamic 5'9" Bronx teen who stood heads above the others in all-around musical talent - singing, songwriting, piano, drums, bongos, high-spirited delivery with a finger-snapping rhythmic signature. That was Bobby Darin. This year, Ted Chapin, Producer of Lyrics & Lyricists, decided to open the season with Darin's story, a boy born sickly but who grew with ambition and talent. Taking on the part of the dazzling entertainer was a charismatic Broadway star, Jonathan Groff (Spring Awakening, Hamilton) who proved, like Darin, that he can swing with natural buoyancy. The Bobby Darin Story is a rags-to-riches struggle of loneliness, love, stardom and wealth, despair and resurrection, all before age 40. The medical prediction of an early death from heart failure always shadowed his life and affected his music, for example, "Artificial Flowers" (Sheldon Harnick/Jerry Bock). Timbers eschewed the narrator's podium on the side of the stage. Instead, four singers strode on stage to read brief clips about Darin, moving along his story from a deprived life to emphasize his intelligence and his musical skills. As well as singing backup, Elena Shaddow played parts of his mother or sister (who eventually admitted to Darin that she was really his mother, an idea that took some getting used to.) 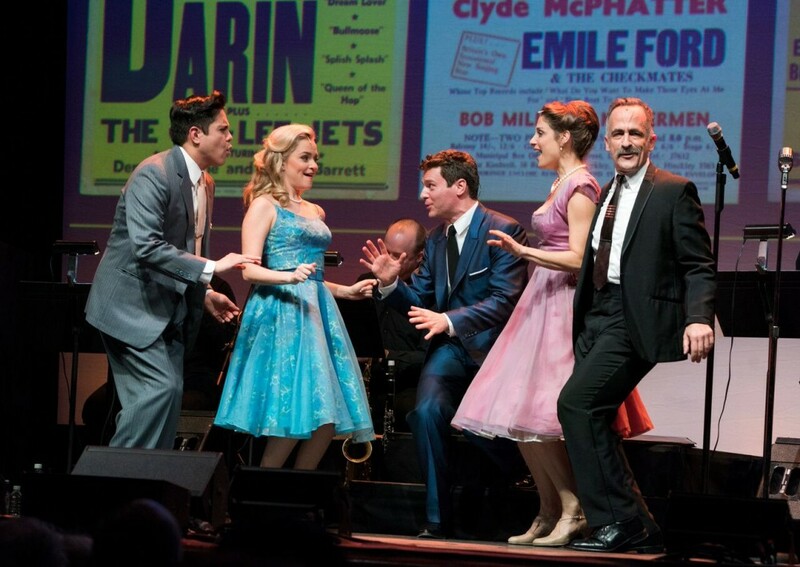 David Pittu stepped in as George Burns, and blonde Stephanie Styles was an obvious bubbly Sandra Dee. Salazar mined a plum spot as Elvis Presley twisting to "Hound Dog" on the Ed Sullivan Show and as Darin's discovery, Wayne Newton, belting "Danke Schoen" (Kurt Schwabach and Milt Gabler, Bert Kaempfert). An enthusiastic audience of mixed ages in the 92nd St. Y indicated the remaining popularity of the Darin hit songbook through the '50's into the early '70's, from standards, "(Up A) Lazy River" (Hoagy Carmichael/Sydney Arodin) to teen-pop originals, "Splish Splash." He wrote 160 songs, notably "Dream Lover," "Multiplication" and "Things" and reflected the folk era with "If I Were a Carpenter" (Tim Hardin). Solid arrangements by Andy Einhorn and Andrew Resnick would have been Darin Delights as would Resnick and Michael Thurber's orchestrations. Opening the show with Darin's familiar rendition of "Beyond the Sea" (Charles Trenet, Albert Lasry, Jack Lawrence), Groff quickly delivered phrasing and tone to illuminate, not imitate, the spirit and ebullience of Bobby Darin. He moved with natural ease and snappy twists and pivots, leading his supporting quartet through the quick-moving, complex story of a stellar pop star. A quintet supplied full-bodied instrumental support. A period touch of wide crinoline skirts for the women was an additional touch of perfection by William Ivey Long. Dan Scully provided bright, relevant projections with John Kelly's light design and Chase Brock's musical staging. After a fast, full life in music as well as acting, politics, and record producing, Darin's cardiac problems, which had lingered through his life, led to his death at age 37. Running time: Two hours, one intermission.